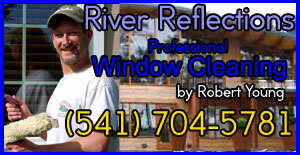 Robert Young & RIVER REFLECTIONS Window Cleaning Service will Brighten the Look of Your Home with a Professional Window Cleaning. Roberts Friendly Customer Service and Professional Workmanship will Revive the Appearance of Your Home. Clean, Streak-Free Windows Every Time, Guaranteed! Let Robert give You a Free Quote Today! Condensation on the inside of a window indicates the humidity levels inside the room are higher inside than outside. Excess moisture on the inside of a window is unsightly and obstructs your view. Follow these easy steps to reduce the risk of excessive condensation. Check all windows and patio doors for smooth operation and airtight seals. Use exhaust fans regularly in rooms with high humidity (bathrooms, pool rooms, kitchens, etc.) Use a ceiling fan to continuously circulate air. Use dehumidifiers to reduce the amount of moisture inside homes with humidity problems. Open windows and doors when practical to reduce excessive moisture inside a home. 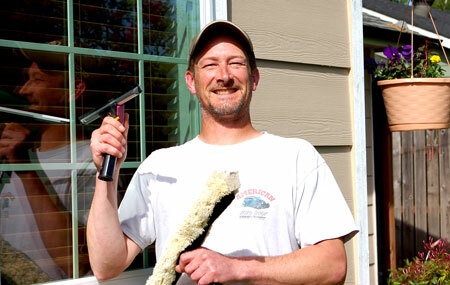 Professional Window Cleaning in Eugene by Robert Young. No Job too large, No Job too Small. 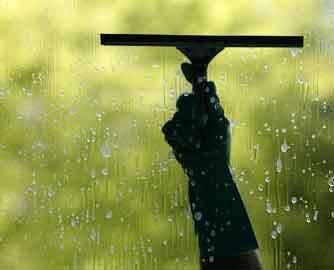 Providing a friendly and personal Window Cleaning Service in Eugene Oregon. Free Estimates fast! Glass Cleaning, Pressure Washing, Graffiti Removal, Mold & Mildew Treatment, Stain Removal, Construction Cleaning, Common Window maintenance, Light Fixture Cleaning, Gutter Cleaning, Fence & Siding Cleaning. Windows are My Specialty. Periodically lubricate all sliding window and door tracks and rollers. We recommend that you lubricate the hardware components once a year. In areas with high salt air, at least twice a year is recommended. Regularly check weather stripping to ensure your patio doors (and windows) seal airtight. Occasionally vacuum the tracks on all sliding patio doors and windows to remove any dirt or debris. Door rollers can be adjusted for proper height clearance. To adjust, insert a screwdriver through the access hole at the bottom of your patio door. Mother nature can sometimes be unforgiving. Fortunately, windows and patio doors have a specially designed "weep" drainage system with vented slots on the exterior bottom of the frames to protect the inside of your home. Proper maintenance of your weep system is required to assure proper drainage. The weep system allows water to drain to the outside as it builds up. It's normal for water to build up on the sill or the outside track, which is why it's important to keep the sill or track clean of any dirt or debris. Periodically inspect the weep holes on the exterior bottom rails to make certain they are clear of any dirt or debris. Use a soft bottlebrush to clear openings, if necessary. A good time to inspect and clean weep holes is when excessive rain is anticipated.